Could giftedness be one of the key ways to discern your calling? In this interview with the Theology of Work Project, Bill Hendricks discusses the significance of giftedness for vocation. Bill Hendricks is President of The Giftedness Center, a Dallas based consulting firm specializing in organizational design and strategic people management. This interview serves as an illustration of "God's Call to Moses (Exodus 2:11-3:22)" in Exodus and Work at www.theologyofwork.org. What does the Bible say about work? 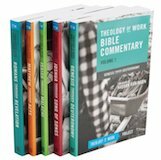 Created by a team of Biblical scholars and business experts, this thought-provoking, five volume Theology of Work Bible Commentary set offers Scripturally grounded insights, wisdom and practical answers for incorporating Biblical truths to everyday life. Useful as textbooks or personal handbooks, these five volumes mine God's Word to uncover practical principles that give meaning and relevance to our jobs.